I swear this room has had furniture in it since the time we moved in, but I just can't ever seem to get the styling/walls the way I want them! It's a syndrome for every room in my house, but the dining room is really close to being done. Close, I tell you! Moving the bar cart left the niche area open again. I repainted the niche in Sherwin William's Tricorn Black, in a flat finish. I like this color so much better than the Urbane Bronze that was once in here. The UB had too much brown in it and it was bringing down the whole space. The stark black is much, much better in here. We decided to fill the space with a white console table. Actually, it is a long desk, but either way it fits the space like a glove. It's long and thin, perfect for what we wanted. This also allows the black wall to still be seen, it adds some nice glossy white paint to the space, and it provides additional tabletop storage. I just love the piece. It's the Besta Burs Desk from IKEA! 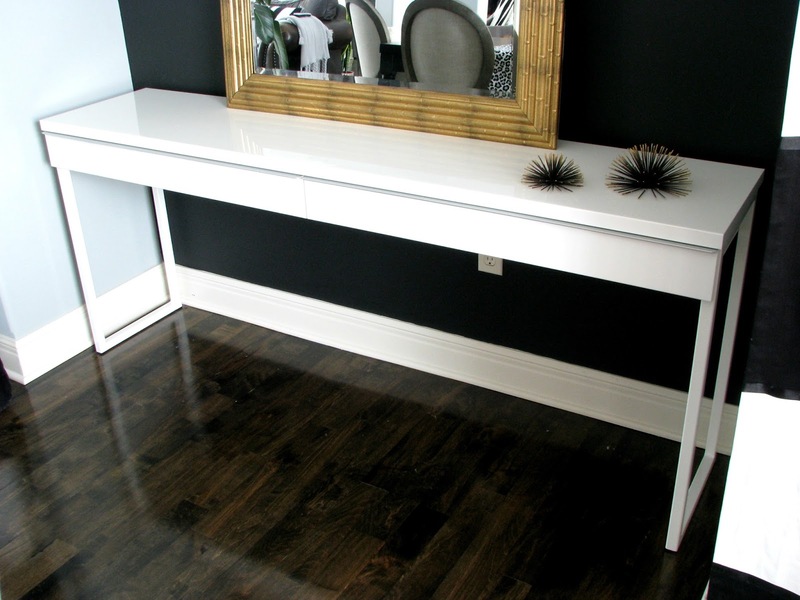 I would recommend this as a console table as well as a desk. I love the glossy white finish and it has two drawers in the front. 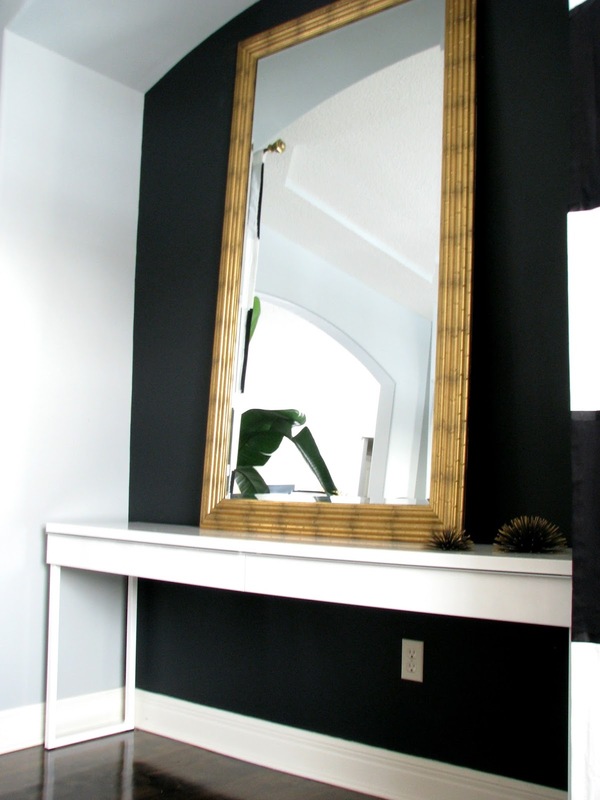 We also purchased this Golden Bamboo Framed Mirror after seeing it in Sarah Dorsey's space at the holidays. I got it on sale for super cheap and I love how it makes the room look taller than it is. I also love how it helps to bounce the light around the room. It also catches the chandelier, which we love so much in the space. The jury is still out on whether to hang the mirror, or keep it leaning. My mom and I were shopping at Homegoods while she was here visiting and she spotted this bust. I have been looking for something to go in the center of the table, and just couldn't find anything that seemed interesting. This fit the bill! It's huge, and it has a cut out in the back so I can add a plant. It's perfect, quirky, different, and just what I was looking for to put in the center of the table. I just need to find a more permanent plant to pop in it! 2) Make a new table runner. 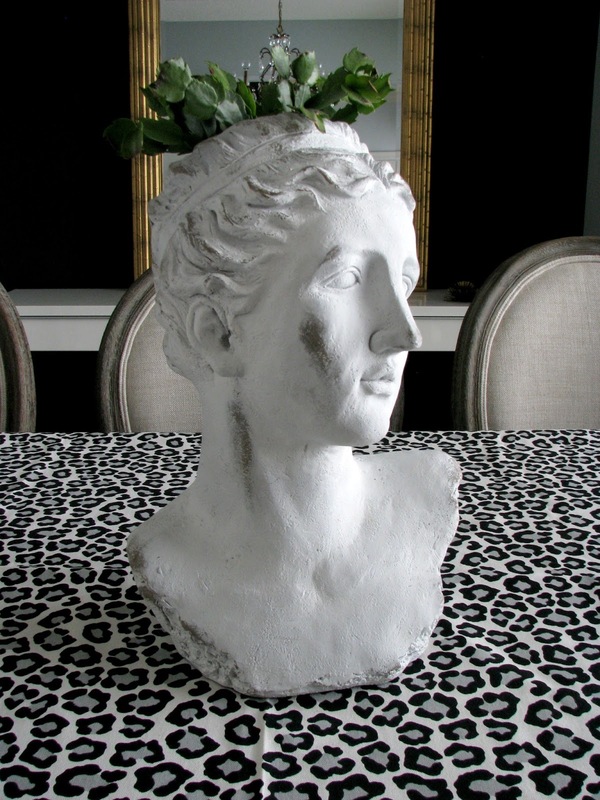 I am looking for some colorful fabric, something spring-like to put under the bust. 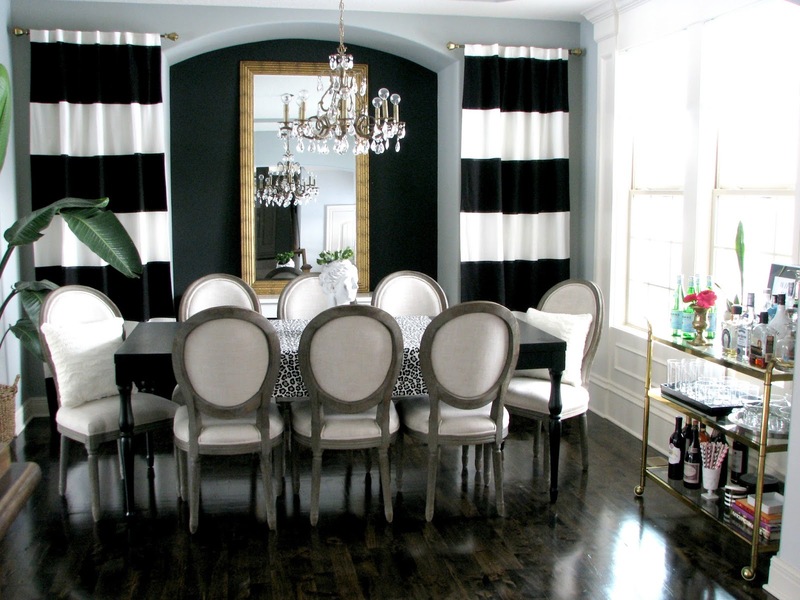 I want this space to be pretty neutral and classic, but I get bored if there is no color. 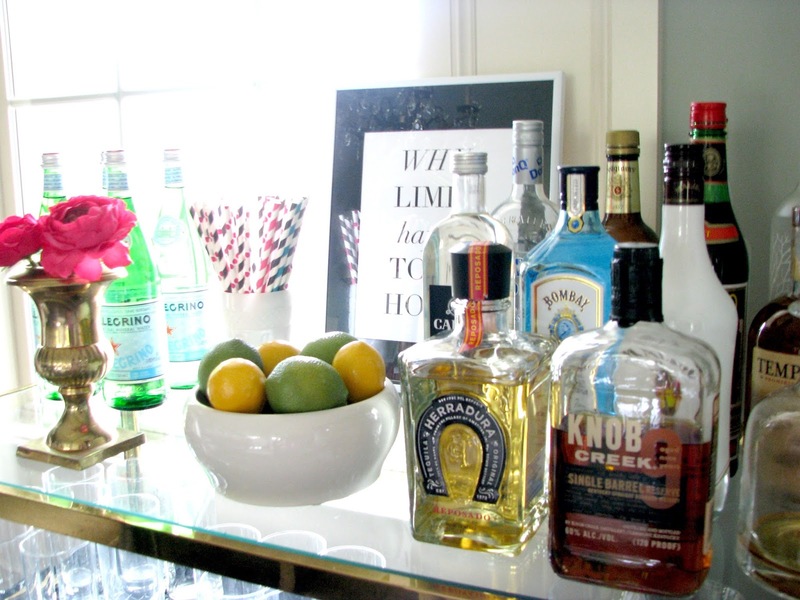 3) Possibly add a lamp to the bar cart. I love these brushstroke lamps, and thinking it might be a fun DIY project. I'm thinking the bar cart needs a little height and this is a good place to add a little fun pop of color. 4) Add pillows to the end chairs. I threw some white ones on there for now, but this is also a good opportunity to add some color to room. I'll probably go with a solid color in velvet, something like these. That's it for now! I'll be sure to keep you posted as new things get added (or removed-ha)! Also, I have changed my blog name to a (.com) instead of (blogspot.com). Blogger should send you right over to the new web address, but just wanted to let you know! 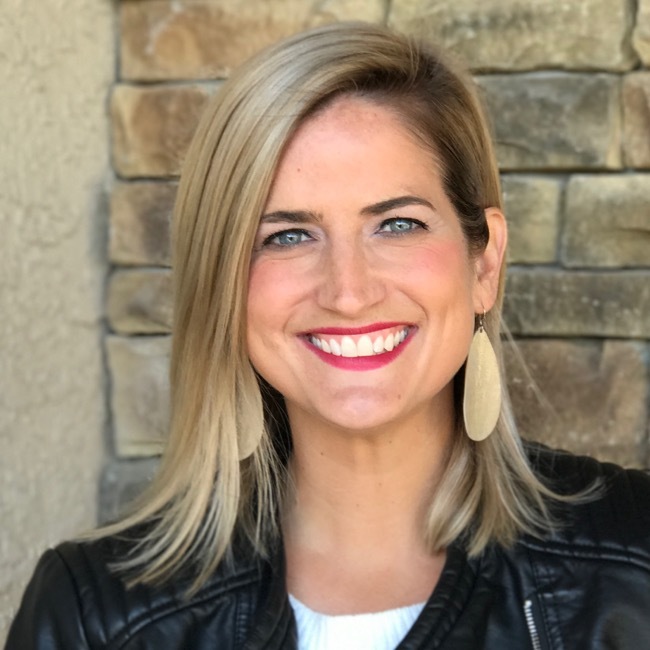 I also want to connect and would love for you to follow along on social media!